Kiss him quick: Mr. Toad takes his last wild ride at Disney World today. Who is Mr. Toad and why does he take a wild ride? To analyze the amphibian psyche, one must refer to The Wind in the Willows, the 1908 children's book by Kenneth Grahame. Grahame's Toad is no prince. He steals cars. He wrecks them. He fights with the police. He's got a bad attitude. He's an affront to the animal kingdom. In The Adventures of Ichabod and Mr. Toad, a cartoon released by Disney in 1949, the film's narrator calls J. Thaddeus Toad "a disturbing factor, a reckless adventurer, having a positive mania for fads while never counting the cost." And that's why Mr. Toad's Wild Ride, which opened at Disneyland in 1955 and at Disney World in 1971, sends guests hurtling through Toad Hall and environs in runaway motor cars. Mr. Toad's driving adventure follows a zigzag track to Nowhere in Particular. You pass through rooms lit by black lights where riders "crash" through a fireplace, a haystack, a barn door and a coop of chickens. What happens to Toads who speed around in stolen cars? Disaster, of course. Riders end up in a Disney version of hell, complete with bright red, smiling devils. The moral of Toad's story: If you play, you must pay. Mr. Toad must atone for his motor mania! And today brings Mr. Toad's ultimate atonement: He's being shut down to make way for a Winnie the Pooh ride. Turns out recklessness and a wanton disregard for authority weren't Mr. Toad's biggest problems. He just didn't sell enough souvenirs. One man's Bufo-sized effort to save the toad. Why does Jef Moskot of Miami think Disney officials are pond scum? Because he's spent a year lobbying for Mr. Toad. When I got that phone call last October, I never expected things to get this out of hand. It was a friend from Orlando, calling to report the news splashed on the front page of the paper: Mr. Toad's Wild Ride was going to be replaced by a Winnie the Pooh ride. I couldn't believe it! The Ride had always been my favorite thing in Walt Disney World, and, indeed, one of my favorite things in the whole world, ever since I was a little kid. I clearly remember holding on to my father's arm for protection while we laughed and laughed at all there was to see. Excited chickens. Weasels. Gunplay. A naked lady. Satan! The Ride was a rite of passage, a thrill ride for those who weren't as tall as the bottom of the sign. How could Disney kill Toad? I immediately called Disney and expressed my displeasure. "No decision has been made at this time," they said, regarding the fate of Toad Hall. The next day, I discovered there was a Web site to urge Toad fans to complain to Disney. Slowly, www.savetoad.com grew. Our forum, the Electronic Toad Hall, features more than 600 entries. These customer comments were mailed in batches of 100 to seven Disney corporate weasels, including Michael Eisner, as well as two Disney departments. And still nothing more than a glorified form letter in response: "No decision has been made at this time." We decided we had to do more. We had to protest in the real world -- get some press! And if we were going to protest, we need shirts and something to distribute. So we printed up shirts that read "Ask me why Mickey is killing Mr. Toad." We designed postcards, simply pleading, "Please do not destroy Mr. Toad's Wild Ride!" At the first "Toad In" in December, people were very nervous. No one knew if we were going to get thrown out of the Magic Kingdom or maybe even arrested. And, of course, these were Disney fans on vacation, not professional activists. We had to be polite but firm. Disney security soon discovered that we were happy to work with them. We didn't want to ruin anyone's vacation, we just wanted people to know what Disney was up to. Our protests got larger. We distributed more postcards. We hired a plane to fly a banner over the Magic Kingdom that read "Save Mr. Toad's Wild Ride!" We got our press. E-mails rolled in daily from all over the world. So far, we're distributed more than 9,000 "Save the Toad" postcards and sold more than 250 T-shirts. There are more than 1,300 people on the Save Toad mailing list. Every day, I check my in box and get angry all over again. Every day someone hears about this for the first time and is just as upset as I was back in October. Every day I read messages filled with words like "heartbroken", "travesty" and some other words that aren't very polite. Every day I read stories of those who experienced their first kiss or their last happy days with their grandparents on The Ride. Stories of the wonder they experienced when they went on The Ride for the first time with their parents and they reflection of that joy in their own children's eyes 20 years later. Crude letters from little kids who can barely type and desperate letters from people who were moved to tears when they heard the news. Letters from Disney employees who can't believe what their bosses have done, thanking me profusely for stepping up and trying to do something about it. Even as I write this, my in box is constantly beeping, letting me know that someone else has just discovered Disney's evil scheme. And I am reminded of the last time I rode The Ride without a cloud over my head, just a few weeks before I knew about Toad's impending doom. I enjoyed it just as much as when I was a kid. Even now I see things in it that I hadn't seen before. Even now I love the spirit of The Ride. It's edgy, but not at all cynical. It just keeps getting better with age. Jef Moskot, 26, is a computer specialist and film student at the University of Miami. He and J.T. Toad's most loyal fans will make one last protest and take one last spin on the wild ride today at 5 p.m. in the Magic Kingdom. Beginning next summer, The Many Adventures of Winnie the Pooh occupies the spot vacated by Mr. Toad. The new ride will take guests through the Hundred-Acres Wood in vehicles shaped like "hunny" pots. They'll cruise past Owl's toppling house, save Piglet from rising water in a Floody Place -- and finally arrive alive at a party with Pooh and friends Eeyore, Gopher, Owl, Rabbit and Tigger. 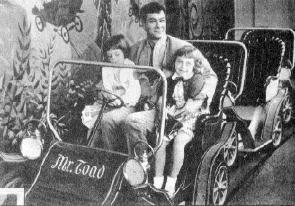 Tony Curtis takes his daughters, Jamie Lee (left) and Kelly for a spin on Mr. Toad's Wild Ride in the early years of Disneyland. Though the ride ends today at Disney World, the wild ride continues at Disneyland in California. A rare Mr. Toad souvenir pin from Coca-Cola. Disney sells no Toad souvenirs. No one at Disney will admit it, but . . . The fine line between a Magic Kingdom ride that's a timeless classic or time bomb seems to be tied to T-shirts, caps and cups. Count the number of rides in which you don't exit into a souvenir store or stand selling the ride's characters. There are no Mr. Toad souvenirs at Disney World because, said several employees, there is no demand. 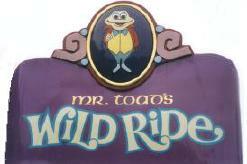 Mr. Toad is one of three "dark rides" Disneyland developed in the '50s. Snow White's Adventures and Peter Pan's Flight are the others. Though Snow White is as old as Mr. Toad, souvenirs tied to the Prince-starved Miss White and her pack of midgets still sell well. Peter and Tinkerbell do, too. Without souvenir sales, a ride needs corporate cash. It's A Small World sells no sizzle -- but the ride is presented by Mattel Toys. More than 9,000 'Save the Toad' cards have been mailed -- to no avail. Toad's legs hit the frying pan on Tuesday. All written content ©1998 Palm Beach Post. Republished with permission.